Successful dieting and weight loss usually involves both exercise and diet. Exercise will help you burn more calories and dieting is critically important because you cannot lose weight if you consume more calories than you burn. Most people will need to lower the amount of calories they consume by eating foods lower in calories. Squash is a low-calorie vegetable that can help you lose weight, provided you familiarize yourself with how weight loss occurs and how to incorporate the veggie in your meal plans. Dr. Jonny Bowden, Ph.D. and Clinical Nutrition Specialist, writes in his book "The 150 Healthiest Foods on Earth," that there are two types of squash, summer squash and winter squash. Both offer specific advantages. Dr. Bowden reports that summer squash is good for weight loss because it is the lower of the two in calories. Spaghetti squash is a type of summer squash that is a particularly good diet food. One cup of spaghetti squash has only 42 calories and contains moderate amounts of potassium and vitamin A. It also has 2.2 grams of dietary fiber that can help curb your appetite. While summer squash is lower in calories, winter squash offers its own weight loss benefits. 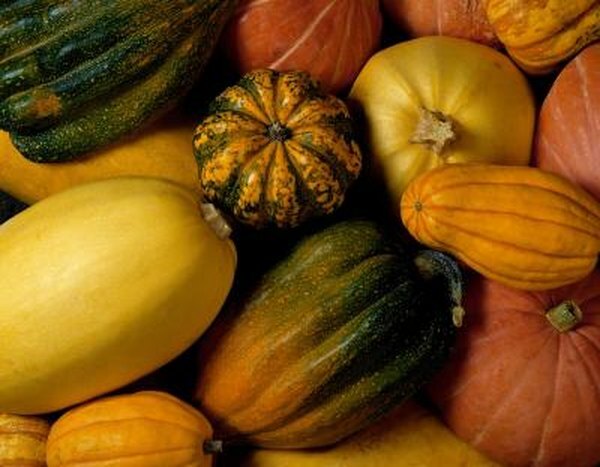 Winter squash is higher in calories and carbohydrates than summer squash, and it is also much higher in dietary fiber. For example, acorn squash, a specific type of winter squash, has 115 calories per cup but also has 9 grams of dietary fiber. That is three times the fiber of spaghetti squash. Not only does dietary fiber help satisfy your appetite but it directly aids in weight loss by slowing down the rate that your body absorbs sugar and glucose. This keeps your blood sugar levels stable and discourages your body from releasing unwanted insulin that will store fat. Butternut squash, another type of winter squash, has 6 grams of dietary fiber and is suggested for weight loss. You may know that pumpkin is a vegetable, but according to Dr. Bowden pumpkin is actually type of summer squash, even though it usually makes its appearance around Halloween or Thanksgiving. Pumpkin, like spaghetti squash, is low in calories and recommended for weight loss. Just 1/2 cup of pumpkin has only 40 calories and 8 grams of dietary fiber. Pumpkin is packed with potassium, with 1 cup containing 564 milligram, which is three times more than a medium-sized banana. Pumpkin also has large amounts of vitamin A, beta carotene, alpha carotene, lutein and zeaxanthin to help support your eyesight. Summer squash and winter squash are both ideal for weight loss because they are low in calories and have dietary fiber. Simply eating squash will not make you lose weight however. As the Centers for Disease Control and Prevention explain, you will need to substitute low-calorie vegetables for high-calorie foods. This will remove calories from your diet. For example, replacing a 500-calorie side dish of macaroni and cheese with a 40-calorie side dish of spaghetti squash will remove 460 calories from your caloric intake. Ideally, according to University of Illinois, you want to remove 500 to 1,000 calories from your daily diet. This will cause most people to lose 1 to 2 pounds a week.